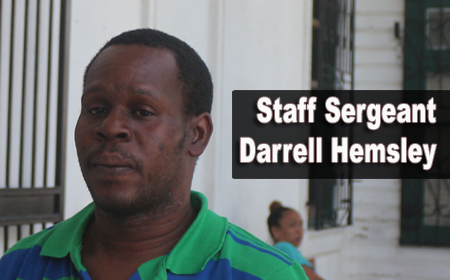 BELIZE CITY, Fri, Feb. 17, 2017–A Belize Defence Force Staff Sergeant who was criminally charged with wounding after he had beaten his wife and she had filed a complaint with police, was found guilty of the charge when his case concluded today in the Magistrate’s Court. The guilty verdict that resulted in a prison sentence has brought an abrupt end to the solder’s career. The incident which landed the BDF Staff Sergeant before the court occurred on November 26, at the couple’s home on Banak Street. Tricia Hemsley, Darrell Hemsley’s wife, testified at the trial that Hemsley came home from work and accused her of having his social security card. In her testimony, she described how Hemsley attacked her, punched and kicked her. Tricia was given a police medico/legal form on which a doctor classified a cut wound and swelling on her forehead as wounding. She also testified that her mother, Marcela Sutherland, had intervened in an effort to stop Hemsley from beating her. Sutherland was also one of the witnesses against Hemsley and she corroborated her daughter’s testimony. Sutherland told the court that she physically attempted to put herself between Hemsley and her daughter to stop him from beating her, but he continued to punch her. Hemsley, who was not represented by an attorney, testified in his defense and told the court that he had approached his wife and if he had not done that, there would not have been the struggle between them. Hemsley told the court that he did not see any blood on his wife’s forehead. He had only seen a swelling.